1. Card Base - Main card base was cut in White Daisy (A2 card size or 11"X4.25") Score and fold in half. 2. Layer 1 - Cut first layer of card inside background in Autumn Terracotta card stock. Score in the middle, to create the stand notch, fold card in half and score both sides at the inside edge in between the two slit cuts. Fold in opposite direction as card fold to create the stand. 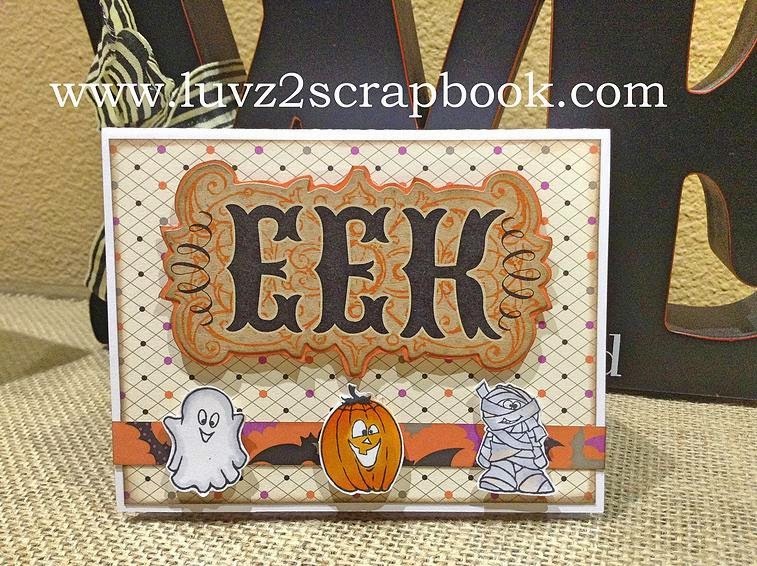 Stamp Happy Halloween on the bottom center of card interior using black archival ink. 3. Layer 2 - Cut in Saddle Card Stock the tree, and black card stock the fence and haunted house. If you are using a Cricut Explore, all pieces are grouped togehter and will be cut sequencially. 5. Accent - Using a black archival ink, stamp 3 different images from the Frightfully Fun Stamp Set, color using your favorite coloring tool and use 3-D foam tape to adhere to front of the border. I used the Eek sticker from the Scaredy Cat Compliments, used Autum Terracotta as a backing and fuzzy cut around. 6. I used the Wink of Stella Clear Glitter Brush Marker to add some glitz to my card, I also used the Wink of Stella Golden to color the moon and added some black stars from the Scaredy Cat Assortment.